An Irish Pub? I’ll Drink to That! 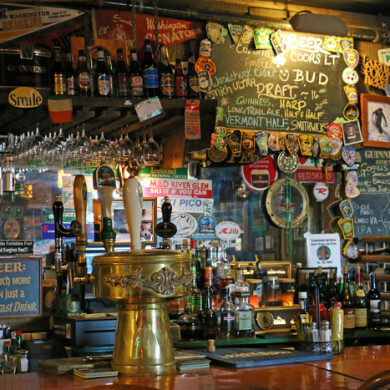 If you’ve never had the pleasure of visiting a true Irish pub – you know, like, IN IRELAND – pop into McGrath’s Irish Pub in Killington Vermont during your stay, and you’ll feel like you have. Innkeeper of the Inn at Long Trail, where McGrath’s Irish Pub makes its home, Murray McGrath gives the place its old Irish charm, from the boulder that doubles as a couch to the beers served by the pint full. The first to offer Guinness on draft in Vermont, McGrath’s also still sells the most of it … and boasts the state’s largest selection of Irish Whiskeys. If you visit on a weekend, you’ll hear live Irish music on McGrath’s stage at 7:30(ish) p.m. Pass the time with a game of darts or a game of football on the large flat-screen TV. When hunger sets in, the pub serves up traditional fare including onion soup, Irish spuds, assorted salads, pastas, sandwiches and a great Shepherd’s Pie. The Guinness Stew is a local favorite, best enjoyed near the cozy fireplace. The Inn is built into the mountain, and the bar is built around natural materials, like that rockin’ seating we mentioned before. It is decorated in all things from the Old Country, shades of green and flags proudly flying. With a super friendly staff, a band called Extra Stout and libations to match, you’ll feel as if you’ve been transported from Killington to good ol’ Dublin. McGrath’s is located at 709 Route 4, Sherburne Pass in Killington, VT. For more information, visit the McGrath’s Irish Pub website or call (800) 325-2540.